The Cuban artist Carlos Alfonzo had always contemplated the complexities of life and its end, even before he was diagnosed with AIDS in 1990. In “The City” (1989), a painting depicting a drug bust Alfonzo witnessed on South Beach, he “wanted to deal with color, at least to complement or balance the horror of violence with the beauty of nature.” Alfonzo created paintings and sculptures constantly, as a means of — Trasobares explains — emotionally “‘unloading’” those tender themes of human existence. 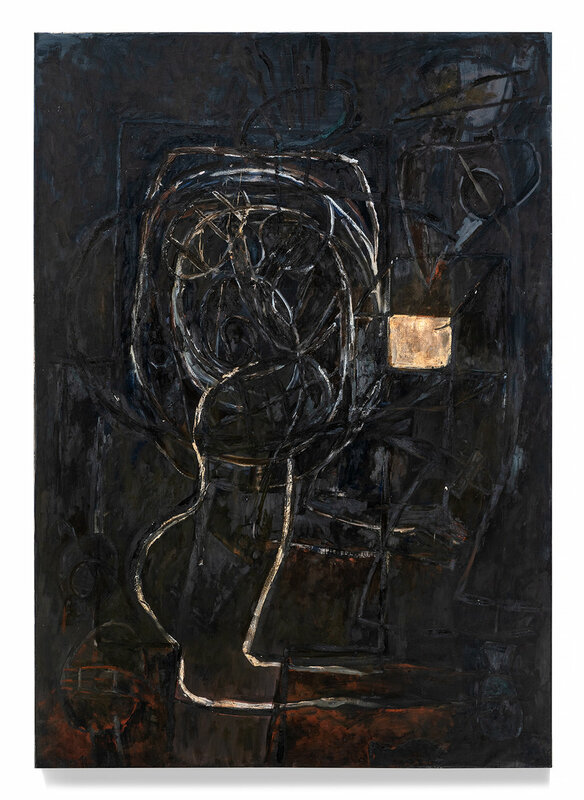 The only period in which he did not paint were the few years following his 1980 arrival to Miami via the Mariel boatlift — a kind of reprieve as he processed the trauma of refugee camps and gaining asylum. He’d left his son, parents, and ex-wife in Cuba; the whimsy of his earlier Cuban work gave way, then, to something else. 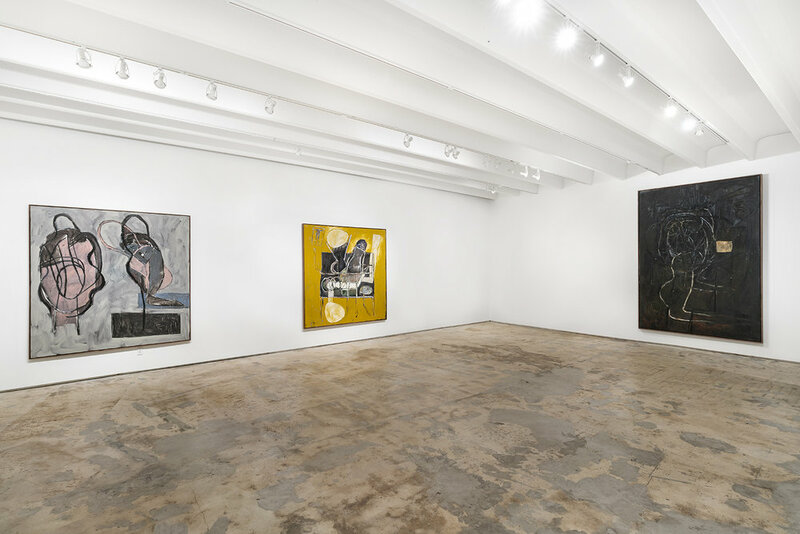 Fredric Snitzer Gallery’s exhibition Painting focuses exclusively on Alfonzo’s work from 1990, the period following his diagnosis with AIDS and the news of his father’s passing. 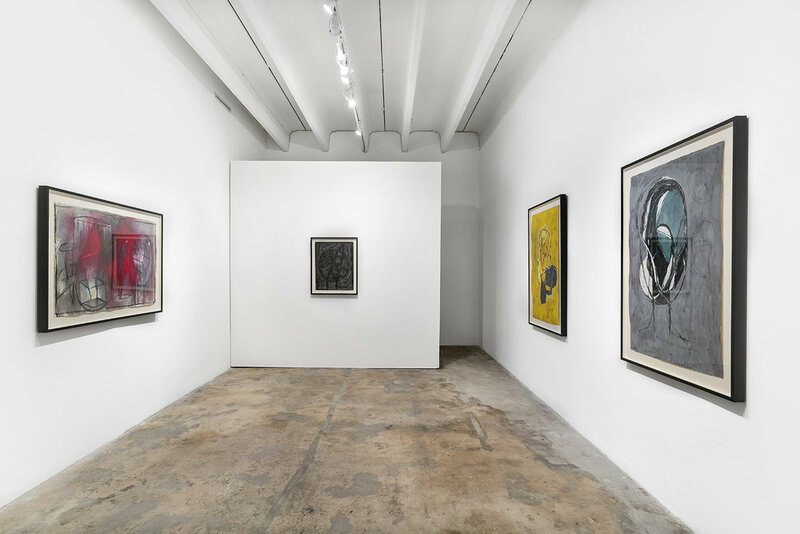 There are large-scale pieces from his renowned Black Paintings series here and each contends with mortality, spirituality, the loss of Alfonzo’s friends and partner, and a general acquiescence toward the trajectory of his illness that is nonetheless resolute. Even the darkest of the Black Paintings — which weren’t all undeviatingly black — are laminas of color: “Home” (1990) is layered with blues, sienna browns, and glittering golds; the canvas of “Still-life with AIDS Victim” (1990) is a deep yellow, the slouched figure on a hospital bed next to a medical apparatus that’s rich as the sun. “Untitled” (1990), a gouache on paper, glows bright red through a mostly grayish palette. Most of Alfonzo’s works from that year contain traces of a body — he sometimes described a few of these figures as a “witness” — such as the kneeling form in “Untitled (from the Pulpo Series)” (1990), the limb-like sinew in “Home,” or the ovular head motif — which he once attributed to the orisha Elegguá, a gatekeeper in the Santería religion — present in two images both titled “Screaming Head” (1990). Each “screaming head” is its own gaping vortex — one dark, one a mustard color, both containing what appear to be hands thrown up alongside the titular heads’ cheeks in anguish. The symbolism of Santería — an eye with a dagger-pierced tongue beneath — and other religions were themes he’d always used, fascinated as he was by the mythos of the Tarot, Catholicism, and the Rosicrucians. Carlos Alfonzo: Paintings continues at Fredric Snitzer Gallery (1540 NE Miami Ct, Miami) through July 14.